Misterios de Un Minuto: Matemáticas (One Minute Mysteries) (Paperback) | River Dog Book Co.
Got a minute? 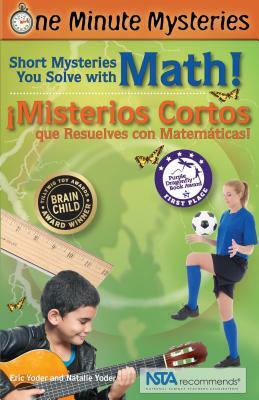 Have we got a mystery for you Our best-selling math title is now available in a bilingual edition It fills a huge void at a time when the need--and interest--in bilingual education has never been greater. These mysteries have a clever twist--you have to be a super sleuth, tapping into your math wisdom and critical thinking skills to solve them. Each story, presented in both English and Spanish, takes just one minute to read and challenges your knowledge in a variety of math disciplines. These brainteasers keep you engaged and eager to learn more. This bilingual edition of One Minute Mysteries: 65 Short Mysteries You Solve With Math was written by the father-daughter team that brought you the three award-winning One Minute Mysteries books. This entertaining and educational book is great for kids, grown-ups, educators, and anyone who loves good mysteries, good math, or both Praised by the National Council of Teachers of Mathematics Recommended by the National Science Teachers Association "Brain Child" Award Winner. Eric Yoder is a writer and editor who has been published in a variety of magazines, newspapers, newsletters and online publications on science, government, law, business, sports and other topics. He has contributed to or edited numerous books, mainly in the areas of employee benefits and financial planning. A reporter at The Washington Post who also does freelance writing and editing, he was a member of the Advisory Committee for Science, Naturally's 101 Things Everyone Should Know About Science. He and his wife Patti have two daughters, Natalie and Valerie. Eric can be reached at Eric@ScienceNaturally.com Natalie Yoder is a college student whose favorite subjects include psychology, science, and photography. A sports enthusiast, she participates in gymnastics, field hockey, diving, soccer, and track. She also enjoys writing, being with friends and family, and listening to music. She has been interviewed several times, along with her father, on National Public Radio to talk about their work on their One Minute Mysteries series: 65 Short Stories You Solve With Science! and 65 Short Stories You Solve With Math! She looks forward to writing more books. She is thinking about careers in oceanography or photography. She can be reached at Natalie@ScienceNaturally.com.Yana Alfaro was born and lives in Costa Rica. She previously graduated with a B.A. in English Studies and has recently gone back to university to finish her Masters in English-Spanish Translation and major in Sustainable Development and Gender Studies. These majors perfectly fit her passion for experiencing and learning about different cultural backgrounds. She spends most of her time leading groups of volunteers from the U.S. and Canada all over Costa Rica and Latin America. Karen R. Geating was born and raised in a bilingual home in San Juan, Puerto Rico. She moved to the Washington, DC area to pursue a career as a U.S. Government attorney. In 2005, she began living abroad, first in Southeast Asia, then in Africa, and eventually in Latin America. While overseas, she worked as a language teacher and consultant. She has recently returned to Washington, DC, with her husband and two children. She is fluent in English, Spanish and French, and is currently working as a language services consultant. She can be reached at Karen@ScienceNaturally.com.